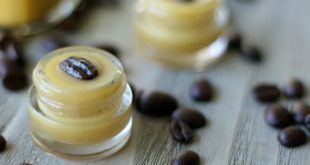 This easy homemade finishing powder DIY recipe absorbs oil and shine, prolongs the wear of makeup, provides a flawless, airbrush looking finish & reduces the appearance of pores and fine lines! The start to our Pennsylvania summer has been unusually hot and humid. I love summer so this isn’t a problem for me, but what has been a problem is my face. Well….the makeup on my face, that is! In this extreme heat and humidity, my makeup just doesn’t seem to stay put all day. Pair that with a little extra summertime oil and shine and I’ve been a hot mess! I don’t wear a lot of makeup in the summer, but when those special occasions strike, I want my makeup to last and look good all day. I don’t think that’s too much to ask, right?! So I talked to some of my fellow make-up loving girl friends and they suggested that I try a finishing powder. You probably already know that natural products are important to me (especially since I’m putting it on my face), so I started looking around for a finishing powder with natural, organic ingredients. And what I was surprised to discover is that the ingredients in these natural finishing powders are insanely simple. And what’s even better, I already had them in my cupboard…woohoo! So I did a little experimenting and came up with a truly awesome homemade finishing powder recipe that I absolutely adore…… and it costs just a few pennies to make! I’m so pleased with it and can’t believe it took me so long to wear a finishing powder. I love this stuff!!!! No more shine. Makeup stays put all day. Smooths my fine lines and gives me a flawless, almost airbrushed looking finish. Where has this stuff been all my life?! 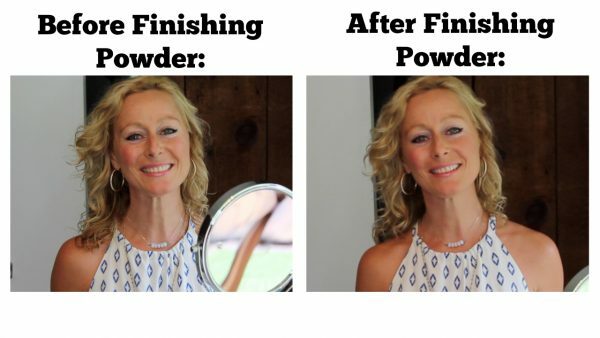 What does Finishing Powder do? Just a super light dusting is all you need to give a soft, matte finish and leave your skin looking smooth (almost airbrushed!) and fresh. It provides a translucent finish so it compliments any skin tone. A finishing powder should be applied after all your other makeup has been applied. You can also wear it by itself for a softened, smooth appearance to your skin. The really cool thing about this particular finishing powder recipe is it contains healing clay. And healing clay is so healthy for the skin! Healing clay helps fights redness and inflammation. 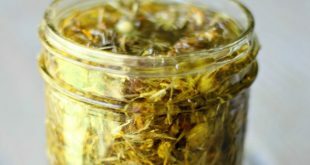 It’s especially known for it’s ability to keep skin clear (great news, especially those with acne prone skin!). Over time, healing clay can really transform your skin. It has mine – I love that stuff (I get it HERE)! Combine the arrowroot powder and healing clay in a small jar or empty powder makeup container. I like to use small, wide mouth mason jars (THESE). Apply a very small amount to a large makeup brush (I use THIS kabuki brush). Tap off any excess powder that’s left on the brush. Apply a very light dusting to your entire face after all your other makeup is done. The key to using any finishing powder is to apply a very light dusting. You can also use this homemade finishing powder over bare skin for a softened, smooth appearance. I often get asked what makeup I use and since we’re talking about makeup, I thought this would be the perfect time to fill you in. I wear the majority of my makeup from a company called 100% Pure and have for the past 4 or 5 years. I love *mostly* everything I’ve tried from them. I especially appreciate their truly 100% pure ingredients (so natural you can eat them!) and their easy, no hassle, free returns (in my opinion, that’s a must for shopping online – it makes it risk free!). 100% Pure Healthy Skin Foundation in Golden Peach (Find HERE) In the summer, I also really like their tinted moisturizer with SPF. I have tried 100% Pure’s other foundation formulas and am personally not a fan. 100% Pure Fruit Pigmented Luminizer (Find HERE) – love this stuff! If you’ve never tried a finishing powder before, I’m so excited for you to try my recipe! It’s so nice and your skin will love it!!! Enjoy! Hi This is the first time I have seen the Make-up that you use. Lovely, I’m going to make the finishing powder. I was wondering which under eye concealer you use, or were you blessed with no dark circles. I am a lot older, and wear no make up other than eye makeup. I do use a concealer but it’s not great. I strive to use only organic or natural make-up I get at the health food store. I love your LOOK.. I am fair, with a pink complexion. If you could let me know which one is on the pinkish side I will order the concealer and also the mascara. Hi Linda! I don’t use an under eye concealer and so I’m no help in this situation. I’d love to hear from any readers who could offer some advice and/or reviews on good ingredient concealers. The cool part about both 100% Pure and Beautycounter is that they offer no risk shopping with easy, free, no questions asked returns on anything that you don’t like or the wrong color, etc. That is so important to me when shopping online for makeup – it’s hard to get the right colors off of a computer screen sometimes! I have pinkish skin, too and I’ve found that warm bases work especially well for me. Thanks so much Kelly, I will give them a whirl.. Love your site, lots of interesting information for a more natural, healthy life. We never to old to learn !! 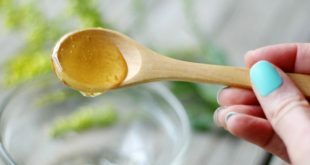 Thank you for sharing the recipe I can’t wait to try it, also something that is healthy for your skin. I hope you like this as much as I do, Donna! Kelly, I’m so excited to try this powder since I actually have the ingredients!! And I’m going to try the 100percent pure makeup. I’ve been hearing good things! Thanks for telling us your makeup faves…so helpful!!! Hi, I was wondering about your opinion on Juice Beauty? Hi Elizabeth, I have no experience with Juice Beauty, but I just looked into it and it looks really nice – I love the ingredients! I’m excited to try it out and see how it performs. It’s so nice that more clean, natural, organic makeup options are becoming available!!! I’ve used starches like arrowroot or cornstarch mixed with enough cocoa powder to match my skin tone. It really does give an airbrushed look and controls shine. Plus I smell like chocolate all day! I’m trying this recipe next. Thanks! Hi Kelly! Can’t wait to try this over my 100% Pure make-up (which I LOVE!!). If you suggest something I always try it as you haven’t steered me wrong yet! 😉 Thank you SO much! Hi Kelly, it looks very light is there any natural pigment I could add to the recipe to make it darker? Just found your site again and wanted to let you know that I’ve been making this finishing powder for a few years now 🙂 My skin is super oily so the bentonite clay does wonders for me. I have played with ratios too and have even done a 1 to 1 ratio of bentonite with arrowroot when mixing it. In a pinch, tapioca powder has worked for me, too, if I don’t have arrowroot. And if I get very tan in the summer, I add in cocoa powder until it matches my skin tone. 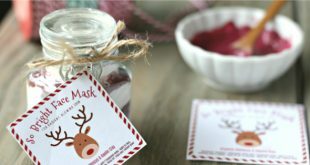 I stopped buying commercial powder because of this recipe that I was able to tweak for my skin type. Now if only I could figure out how to make it in a compact! Thanks!